The far-away sound of the horn moved closer and was repeated again and again, each time ending on a more celebratory and impatient note, and finally bursting into a long and glorious roulade of a victory march. Yurick frowned, and looked closely at the noisily cheering crowd of elves, trying to figure out the reason for the excitement. Perhaps his King had decided to end his mysterious assignation and was coming back to the feast? But at that moment the colorful assembly of dancing, drinking, and carousing inhabitants of Suldanessellar parted, letting through a small group of elves dressed in plain green and brown attire, obviously not intended to be worn as party clothes. “Rillafane be praised – they have returned unscathed, and just in time for the festival!” These and many similar cheerful remarks were shouted from the crowd. Each one of the newly arrived was either carrying a long bow and a quiver full of white-and-green fletched arrows or a short green spear, carved with many strange designs and tipped with a bronze head. Overall, the company projected an image of a wickedly efficient, feral troupe, ready to spring into action at first call of their leader. The newcomers’ faces, arms, and all unclothed areas of their bodies were covered with stripes of green and black camouflage paint. Yet some of the marks and swirling lines on their faces were painted in more disturbing, ochre tones. Those had a smeared look about them, as if applied hastily and without much care. The young viscount Gulderhorn flinched, thinking of the probable source of this other dye. He heard rumors that some orc and goblin tribes used their enemies’ blood to decorate themselves after battle, but had never expected the elves to emulate the custom. Admittedly, all the loud clapping and cheering seemed to be coming from younger males, while the elder elves frowned and averted their eyes from the all-telling reddish-brown marks on the hunters’ cheeks and foreheads. That was when Yurick spotted the apparent leader of the troupe – a near-naked elven female, wearing only a few strings of leather and fur and an ornate waist belt with a scabbard that held a long blade. But it was the item hanging next to her sword that pulled all eyes like a magnet. A piece of leather cord, with a cluster of small objects looking like shriveled mushrooms or pieces of meat jerky strung on it. These must be orc-ears, Yurick understood with a sudden fit of nausea. Being born into a family that praised itself for its unwavering loyalty to the Tethyran Royal line, he had participated in a quite a few military skirmishes and had sheathed his sword in orc-flesh more often than he liked. Yet collecting enemy’s ears as a proof of his heroic deeds would have been considered complete barbarism among his human comrades. Smiling leisurely, the huntress stepped into the circle of well-wishers and admirers. She was gorgeously built and her alabaster skin, which had been painted or tattooed with the same savage exuberance, shone like ivory amid deep copper complexions of her followers and bodyguards. A dark mane of hair framed that unnaturally pale visage; strikingly bright blue eyes sparkled on a face of stunning, if a little feral, beauty. Yurick caught her mockingly appraising stare and flinched, realizing that despite his disgust over her grisly trophies his mouth was gaping. They were all trying to touch her hands or parts of her skimpy outfit, competing with each other for this ambitious privilege, and she had to smack away a few hands that were too bold in their quest. One of her two escorts, the tall and darkly handsome warrior type with a long bow, scowled, and the group of excited youngsters shrank back, although not far enough to allow their idol go free. The other one, a pallid and unsmiling elven male in plain mage robes, made a quick gesture as if to start casting an arcane spell, but the woman spotted his faint motion out of the corner of her eye, and slapped him on the arm with the same expression of amused irritation that she had earlier used on the youths. “I am sure we will all be civil to each other and enjoy the festivities. Dueilil, dear, be gentle with poor boys. There is no need to change them into anything nasty, just because they love me so much,” the woman sang demurely, without a slightest change in tone of her low velvety voice. Bodhi’s words were met with an explosion of laughter form the crowd of youths, followed by a round of applause and a few good-humored suggestions to the seething mage. After basking for a while in this fresh explosion of affection, the huntress turned back to her humiliated follower. “Darling, I want you to run to the Palace, and inform Captain Aduo'on of our arrival. Don’t forget that our duty is first and foremost to the Queen and the People. And take this with you as a proof of your words,” she unfastened the string with orc-ears from her belt and handed it to the mage. He started to object, but one hot stare of Bodhi’s bright eyes followed by arching of a sable eyebrow, was enough to send him scampering through the laughing crowd. In the mean time, the huntress turned back to the abandoned warrior, and graced him with a smile as bright as the stars in the sky above. “And what are you going to do if I leave you here alone?” The warrior’s dark stare fell back on the group of boys that was still tossing around them. Pale rays of moonlight poured over the Suldanesse valley, shrouding the whispering mass of trees and the emerald dells by the riverbank in silver sheen that felt almost palpable to the touch. Yet the couple that strode along the narrow twisting trail under a canopy of oak, maple and cedar trees was oblivious to the beauty of the night around them: both were lost in deep contemplation over matters more important than frivolous play of light and shadows on the grassy path under their feet. A tall muscular man, dressed in rich festive clothes, seemed fully preoccupied with anticipating the slightest whim of his female companion and watching her every move with eyes full of excited ardor. Yet his fellow traveler – a frail elven woman cloaked in green silk – looked more concerned with keeping her private thoughts to herself, while maintaining a pleasant conversation. “Yes, my dear friend?” the elf replied neutrally, after a near indiscernible sigh. “Ellesime, I... I love you and I cannot contain my feelings for you within my poor heart any more than I can hold the waters of Ith within its riverbed in the rush of the Spring Thaw. Will you… will you marry me?” Ellesime’s face was obscured by the hood of her cloak, and King Errilam half expected her to laugh at him or become offended and call her guards, for he was sure that at least half a dozen elven archers were shadowing them even now, silent and invisible as ghosts. But the Queen of Suldanesselar only sighed again, and they continued their walk in silence for some period of time, until Ellesime shook her head letting the hood of her cloak slide down the mass of her golden-red curls, baring her prominent elven ears to the caress of moon rays. One look at her clean-cut profile washed in moonlight made the human man’s heart beat faster than the wings of his favorite peregrine falcon in full flight. Ellesime’s face possessed the smooth ageless perfection of a bronze stature, but the green fire flashing within the depth of her large almond-shaped eyes lit her features with an intense and dangerous beauty of a living, breathing woman. She was the Sylvan Magic made flesh, and once again King Errilam cursed his human ineptitude in expressing his true feelings. Frankly, he was afraid that one day his poor heart would give up and burst within his chest, unable to sustain the ache of his passion… yet whenever he tried to convey this to Ellesime his tongue would always freeze to the roof of his mouth, and she would smile at his lovesick stares as one would smile at the antics of a small child demanding his dessert before the main dinner course. Errilam’s obsession with Ellesime had already spanned more than a decade. Ever since he – back then only a young duke of a small and unimportant Duchy and a commander of his father’s guards on the elusive border between the settled lands and the forest of Wealdath – had been granted a special audience with the Queen of Suldanesselar, he could not look at any other woman. That first memorable meeting had taken place on the night of a new moon, in a small clearing in the middle of a grove of young oak trees, and had only lasted a few moments, but there his alliance with the Queen of elves had been forged and many more visits and exchanges of letters and gifts had followed later on. After the murder of his seven sisters and nieces, (allegedly by the hand of Harpers’ agents), and his father’s untimely demise, Errilam had been proclaimed the King of Tethyr. Yet even upon receiving the news of his ascension to the throne, his first thought had been of Ellesime, and of how his new status would help him win over her heart. Following a plain and solemn coronation ceremony, the new King had rebuffed both friends’ and matchmakers’ advice and for many years ignored the charms of many beautiful and noble maidens of his court, opting instead to provide the waggling tongues with gossip of his frequent mysterious visits to the elven forests. Finally today Errilam of Tethyr had managed to keep his promise to himself and confess his true feelings to Queen Ellesime, although now he was not sure if this conversation would not be his last ever tête-à-tête with the fair ruler of the Tethyran elves. The King’s eyes flashed with new hope and enthusiasm, but even as he tried to capture her slender hand in both of his, Ellesime stopped him with a mere shake of her head. “Because our feelings for each other were not strong enough?” She finished the implied sentence for him, and the human nodded, unable to open his mouth or take a breath in sudden anxiety that now he alienated her for good. “We have had our difficult times… and yet we are together still,” Ellesime continued musingly. “It is hard to explain this kind of a bond to a non-elf…” Her eyes took a dreamy distant look and Errilam’s heart sank, once again losing the last vestiges of his made-up hopes. 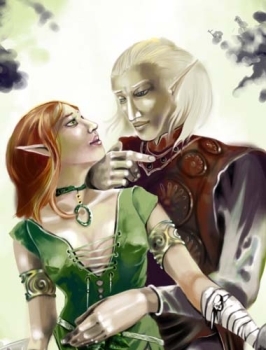 “We complement each other, he and I,” the elven woman finished confidently. “Despite his cold and distant façade, Joneleth is a dreamer, a visionary and a poet at heart, while I am… practical to the tips of my fingernails.” A sudden mischievous smile pulled at the corners of her mouth, and she laughed, deeply and full-heartedly, ending her sudden merriment on the short silvery note that never failed to make Errilam’s head spin. “This means no hope for me, forever?” Errilam asked her one last time, with a sinking feeling of a convict whose application for parole was about to be denied by a stern judge. Nevertheless, his grief was mixed with a weird sense of relief, for after so many years of waiting and hesitation he had finally done the deed, and Ellesime was still here talking to him, even taking his hand into hers. “Forever is a very long time my friend.” The Queen of Suldanessellar replied absently, and Errilam realized that Ellesime was thinking about something far removed, and as distant and immaterial to him as it was intimately close and familiar to her. The King looked at her exquisite golden face and froze – the charming, beautiful, and soft-spoken woman that he knew and loved was gone; what stood there in her place was an immortal goddess with eyes sparkling brighter than the most perfectly cut and polished emeralds gems and a voice that sounded crystalline-bright, and hollow as infinity itself. “I have outlived many lovers and friends, for my time on this Plane is not measured in the same terms as yours, or even Joneleth’s,” the Queen said without taking her eyes away from something that only she could see. “This experience, I fear, gives me an unfair advantage over you. However, it also robs me of something you possess in plenty yet cannot appreciate. The finality of your every passing moment, the precious irreplaceability of your finite mortal love... the ability to say ‘forever’ and actually mean it. All of this is denied to me.” Ellesime turned back to Errilam, and he saw deep sadness sweep over her face, which abruptly lost its divine glamour and became warm and vulnerable once again. “Yes,” Ellesime answered simply. “I will outlast both you and him, and just thinking of it makes my heart cry in misery and despair… yet there is nothing I can do. The ones born into their destiny like you and I, must accept their fate and learn to live with their duties. My duty is to Suldanessellar and her People, as yours is to the land of Tethyr. These duties cannot be denied, however much both of us wish we could escape our fate.” The Queen looked into his eyes as if seeking understanding, and after a pause the human King nodded in reply, thus sealing his final acceptance of her verdict. “I shall never…” Errilam started to protest, but Ellesime only chuckled and put her butterfly-light hand on the crook of his elbow, urging him to turn around and start retracing their steps to the green meadow in the middle of the lush and fragrant Queen’s gardens that hosted this year’s celebrations of the Faradome festival. “Here you are at last,” Bodhi smirked at her older brother, who, to her slight annoyance, did not appear pleased at seeing her at all. She had spotted Joneleth at the very edge of the partying crowd, solemn as a funeral dirge, and apparently engaged in a conversation with his half-breed of an apprentice and the dragon wench. But the frustrated look in his eyes indicated his disinterest in the company he shared, so she had barged in without feeling any remorse. The tall and slender dragoness clad in silver brocade wrinkled her nose, baring a row of teeth slightly too sharp for her elven form, and departed, muttering some scarcely comprehensible excuses. The half-elf Rielev was resilient enough to stick around, and Bodhi gave him a playful smirk and a wink of her bright-blue eye fringed in dark lashes. That diversion was sufficient to bring dark red flush to the mongrel’s pale cheeks, and for the time being render him completely mute. If the dark cloud that gathered around Joneleth’s brow was any indication of her success in ruining his nonchalant attitude, Bodhi had hit a nerve with her first random shot. Her brother’s eyes flashed with blue fire, which had it been real would have been hot enough to ignite patches of dry moss under their feet, and the huntress spotted a slight tremor in his long white fingers, as he unfurled his hands and tucked them deep into the pockets of his indigo robe. “Now, Bodhi, please...” the half-elf Rielev was brave enough to try to intervene, but Jon interrupted him with an angry stare and a sharp exclamation. In the years that had passed since her brother’s spectacular return to Suldanessellar and the mind-boggling events of the weeks that had directly followed his homecoming, their life had settled in a somewhat stable if not perfect routine. Joneleth had become Ellesime permanent consort, and was now residing in the Royal Palace, in the queen’s private chambers. Alas, Bodhi’s ambitious goals for herself remained what they had been seventy years ago – only dreams, and eventually her envy of her brother’s social triumph became something more than obsession. In fact, the idea of besting him became the focal point of her new life as an initiate of Kiaransalee’s faith. Of course, Bodhi’s secret recruitment into the church of the Vengeful Banshee – the drow goddess of vengeance and undeath – had played a role in forming her new agenda. One does not get away with murdering a lover in cold blood without undergoing a deep personality change. Still, the roots of evil that had made Bodhi’s transformation into a ruthless, vicious murderess such an effortless feat, had always been there, and the affair with the cursed ring had only helped to set things on the most natural course. However, despite her fervent ambition to exploit her brother’s relationship with the Queen to her personal advantage, years of trying had come to nothing more than a few failed schemes, as Joneleth was too intelligent not to see through the most devious of Bodhi’s machinations. Yet it seemed that Ellesime’s personal friendship with the King of Tethyr, which started as a purely political affair but had in recent times grown into something more intimate, was a weak spot in Jon’s armor. Bodhi smirked, feeling pleased at her discovery. Perhaps this particular Faradome would prove to be more entertaining than ever. “I have no interest in humans, and no desire to discuss the details of Ellesime’s political maneuvering with anybody!” Jon snapped bitterly, but his reply was too quick, and his voice sounded perhaps a bit too brittle to hold true. “I wonder what exactly she meant by that?” Velemir appealed to his friend after Bodhi had rejoined her pack of juvenile admirers and once again disappeared into the crowd. “And have you done as she bid you?” The half-elf blanched at the thought. “And these would be?” Rielev asked with some relief, gratefully jumping back into his habitual role of a naive disciple under a wise and learned don. If Joneleth was still able to joke, things were not as bad as he feared them to be. Velemir opened his mouth to object, to say that he did not ask for ‘a lesson in theology’, but simply wanted to point out that the ones lucky enough to have love and admiration of others aplenty were often selfish and blind to the sacrifices made on their behalf. But it was already too late – the throng of celebrants had suddenly stirred, separating into two walls of cheering smiling faces, and letting through a slender red-headed elven woman in green silk, closely followed by a tall handsome human in a wine colored mantle thrown over a sky-blue doublet. The Queen of Suldanesselar had finally returned to her subjects, bringing the human King in tow. Rielev heard a brief exclamation of distress and only had a moment to catch a trace of an expression fleeting from his friend’s frozen face, but that flash of admiration and possessive pride, mixed with pure hatred, jealousy and despair was enough to send the half-elf’s heart tumbling down into his stomach. Joneleth rarely showed any open emotions, but when Rielev managed to catch a glimpse of his friend’s true feelings they were often of such magnitude and power that it scared Velemir to the core. The half-elf swiftly averted his eyes, pretending that he had not seen what obviously had not been intended for his eyes. When he finally dared to turn around and ask Joneleth’s opinion on the appearance of the royal couple, the moon elf was already gone, departing in a flash of a second that it took Velemir to adjust his reaction to Ellesime’s peculiar appearance, and his friend’s obvious misery over it.